Similar to the cattle with the same name, Florida Cracker Horses owe their genetics to Spanish stock brought to florida in the 16th century. The Spanish left livestock in the new world to make room for the loot they wanted to take home. Today the breed is also called Chicksaw Pony, Seminole Pony, Marsh Tackie, Prairie Pony, Florida Horse, Florida Cow Pony & Grass Gut. The Spanish stock left in Florida carried a combination of African Barb, Spanish Sorraia & Spanish Jennet blood, similar to Spanish Mustangs, Pasos criollo animals. These animals roamed free for centuries and were shaped solely by natural selection. The breed gained popularity as Spanish cattle ranching grew in Florida during the 16th & 17th centuries. Florida cowmen where called crackers because of the cracking sound their whips made. 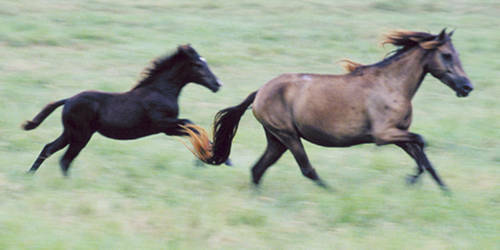 The agile Spanish horses they used for working Spanish cattle soon became known as the Florida Cracker as well. Florida was one of the major supplier of beef for troops on both sides of the US Civil War, which meant that the Cracker horse rose in demand as well. Not only for ranching, but for army transport as well. During the Great Depression in the US a number of relief programs were created and one of them encouraged the movement of cattle into Florida. As larger cow breeds began to make their way to Florida pastures larger Quarter Horses were brought with them to handle the more robust cattle. It wasn’t long before the smaller Crackers found themselves out of demand. Since then a few families have worked hard to preserve the lineage of this unique little horse. The Florida Cracker Horse Association was formed in 1989 by some of the families & they created a registry in 1991. Thankfully these families took their bloodlines seriously because they are the reason Florida Cracker Horses still exist today. Do you have images or know more about the Florida Cracker Horse breed? I’d love help completing this page, please contact me to get involved.